Books... I can do that, too! This picture collection book of John M. Predovic first got me thinking.. and then working. I have made a choice of my best shots from the last season and also put them together in a photo book that is now avaliable at lulu.com. I am not going to get rich on this as the production and distribution cost alone is over 20€ per book, but I think it's a nice thing to have to save the best moments of 2007 on the shelf and then have a chance to look at it once in a while. Also makes for a nice present. Tractorpulling.tv has the Dutch Hot Farm Finals online and finally the US videos of www.whatssmokin.net have shown up on my Tractor Pulling video channel! You will have to download the "VeohTV" application that is linked there to view them in full length - but it's worth it! I keep getting a load of Emails here - while registration is open to everybody except for one person for this week! New Thunder Pulling video out now! Gerald Wallaberger has the new Thunder Pulling video out! This time he covered the European scene again and filmed all over Europe during the 2007 season, including the german championships, Ahoy, the European Championships in Denmark and the Euro Cup Finals in Luxembourg. Our Forum will from now on be for registered users only. Reason is this idiot from LEWISBURG (ZIP 45338) OH who tries to drag everybody through the mud and is even using other people's name to post crap. You now have one week time to register and from then on new registrations will only be accepted by sending your name and address, desired username and password by Email to either pullingworld@gmail.com or pullingdepot@gmail.com. The Blue Hazard Team has their new website online! 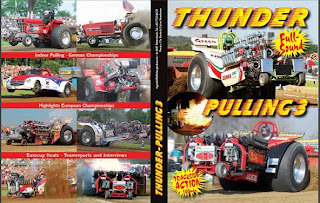 John M. Predovic has published a new picture book with Tractor Pulling pictures from the 1980s. It contains a lot pictures of long gone glory and good memories on 131 pages. Being avaliable on lulu.com it can be quickly accessed from all over the planet and even a downloadable version can be purchased for a cheaper price. Last evening the news spread quickly over the WWW - "Stage 6" the best video sharing platform on the web (or let's say the one offering the best quality of them all) is closing down. They cannot seem to make a profit with what they've done. Now - how does this effect you? Easy - most of the Tractor Pulling videos we've offered on here were hosted there and will now be gone. Of course I already had "Plan B" and I am currently uploading the videos to a new provider where the videos can be seen on my channel - but will have commercials shown before. Heute abend deutscher Pulling Chat! I am sending you some pics of a compact diesel from Holland and it is called Flower Power from Team Versteeg from Holland, they have also a 3.5 supersport IHC 1455 named Dynamite. This compact diesel is in the gardenpulling competition since 2000. In 2001 it was national champion. This winter it has changed completally under the hood, pistons, camschaft ,turbo, cylinder head and so on. And new aluminium wheels are being made by Loenhorst metal who are having 2 compact diesels, they are building a new one. Cepek tyres are ordered in America, and hopely will bring this new package the horsepower they will need. Again Pulling in Europe and especially on the British island has lost one of it's "people of the first hour" and in this case a brilliant innovator, an engineer, quiet the comedian, a man with more backbone than most people I've ever met - and overall a friend! Chris George passed away on February 20th after loosing the battle against cancer. I first got to see Chris at one of the European Championships in the 80s, where he was often competing with his "Avon Lady" tractors. First powered by V8s that later on were turbocharged, then with turbine power - you know, back in the days when it was VERY special to see a pulling tractor powered by a turbine. Then I met him personally at the 1996 Euro Cup at Bernay, where he had his latest creation out, the John Bull, of course turbine powered. Chris entered the track for the drivers presentation dressed like the "John Bull" painted on the fenders of his tractor. The big man put on quite a show in that dress and marched down the track with pride. The tractor also performed well and I remember inviting him over to our home pull the year after. 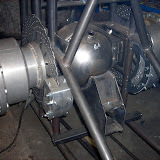 His goal was to improve the tractor to the point where it would be top of the bill in the light modified class with three RR Gnome turbines, that would have given him in excess of 4500 hp at 5500 lbs. Unfortunatly it never happened as new rules were put on turbine tractor in the UK that kept him off the track with the John Bull tractor. Chris always cared for the little guys in pulling and helped A LOT of people to get started. You could always learn from him. I remember him giving me advise on my garden pulling tractor when he saw me do my first steps out in competition. He created the british limited modified class and also rebuilt an old single Rover V12 tractor to compete in this class, which he then sold and that is now running under the name of "Little Gold". Chris also loved drag racing and lately was involved helping with a jet drag car and he also collected army vehicles, which got him on british TV just recently. He traveled a lot, and knowing the end was coming soon, he took the chance to visit a lot of places all over the planet, visiting many of his friends abroad. You could probably write a book about this man and the things he did in his too short life. May he not be forgotten and his ideals held high in the sport of pulling and may there be many people to come that care about what is going on and speak their mind like Chris did, when things turn into the wrong direction... and most importantly: Back it up with action like he did. To quote another british puller about Chris George:"No fool there!" RIP Chris and strength to all the people at Pippenwell! Tonight the Red Painter was officially presented to the public. 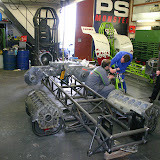 A little party was given by the LP-Racing Team and sponsors, media, friends & resentatives of the german tractor pulling association were invited to check out the latest addition to the german modified competition. After Team captain Markus Pape opened the official part of the evening with AC/DC's "Hells Bells", he introduced the team members one by one (the old Viper crew is almost completely on board) and thanked all his sponors for their help. Then Joop Wouters, the former owner of the tractor held a little speach and handed out a little present to the new owner. More gifts were then given to the new team by various people and finally the president of the German Tractor Pulling Association, Manfred Kilian, welcomed the "Red Painters" on board and wished them good luck for their first season. After this tractor pulling videos from the last season were shown and everybody was invited for dinner. The first event for the Red Painter will be the outdoor pull at Weseke on the last weekend of march. After a lot of complains about me not promoting the dutch pull chat... here it is: Dutch Pull Chat tonigh!!! Not even three weeks to go before it's Ahoy time again! European top riders will be represented at the 30th edition of European Super Pull. As a special attraction, the organisation has managed to secure two American machines to appear at Ahoy! 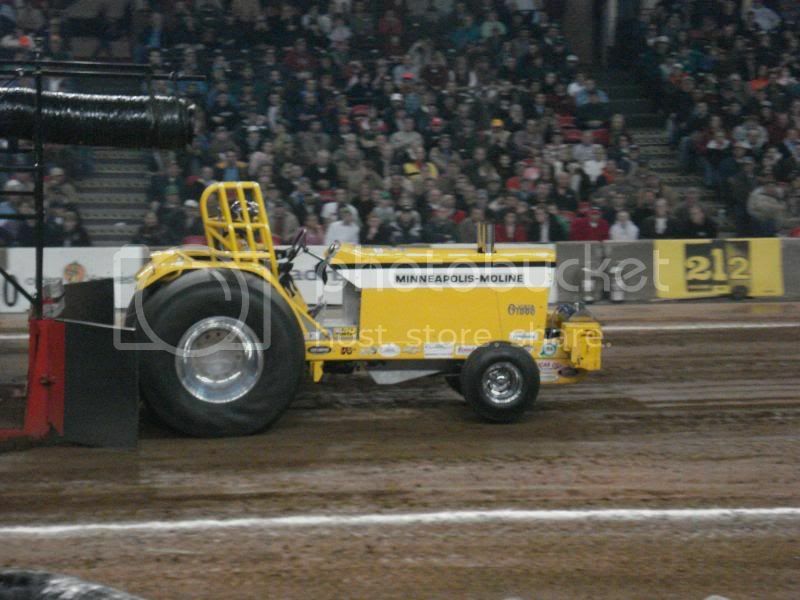 Both Ryan’s Toy II and Double Stuff, owned by Larry Robert from Wilmington (Ohio), will appear in Rotterdam on 8 March. Ryan’s Toy II is a Case International MX270, which competes in the United States in the unlimited super stock class. Under the bonnet it has a six-cylinder Brent Long alcohol engine, which thanks to its three turbos has a capacity of over 4500 hp. The machine is named after Ryan, Larry Roberts’ son. The machine is driven by Tim Howell. Tim is known for his fearless driving style. 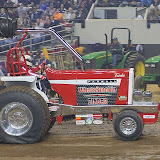 At an indoor pull in Louisville, for example, he drove Ryan’s Toy II several times into the sand pile at the end of the track. Last year, Howell finished fourth in the Grand National circuit in the unlimited super stock class. Double Stuff is a unique machine equipped with two Brent Long DT466 alcohol engines. The power supplies have been bored out to a capacity of no less than 598 cubic inches (9.8 litres) and are each equipped with three turbos. The engines deliver about 4,800 hp each. The regular driver of Double Stuffed is John Evans, who works for one of Larry Roberts’ companies and is a mechanic in the Roberts pulling team. He is also the regular driver of the super stock Big Toy II, with which he won the well known indoor race in Louisville (Kentucky) in 2005. Double Stuffed made its appearance on the circuit halfway through the 2007 season. After a cautious start, he soon got into winning ways. At the Grand National pull in Tomah he finished second in the modifieds class. On the 6th. and 7th. 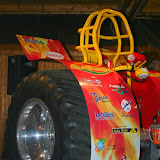 of September 2008 the European championships in Tractor Pulling will be arranged by the Jæren Tractor Pulling club at their facility located just outside Bryne, about 30 km south of Stavanger. 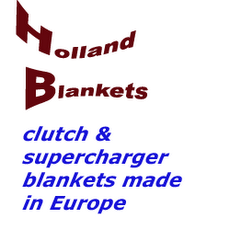 Check out their new website for the 2008 European Championships! Check out Zach's NFMS pics! 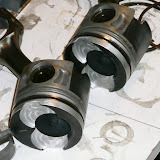 First load of pics by Brian L.
And another top heavy mod rebuild!